admin – CANNTOP AI INC. The global health crisis around opioids is most profound in the USA and Canada, and Health Canada has recently published research on this topic using Nexalogy technology. Health Canada wanted to explore the opioid crisis in Canada and used social media as a s ource of data to discover public conversations. Social media such as Twitter makes it possible to obtain real-time information, which is why Health Canada was interested in obtaining information on the use of opioids and the perceptions surrounding these substances in Canada. To collect pertinent data, Health Canada used Nexalogy. The data was collected between June 15th and July 13th 2017, on Twitter, and uncovered discussions about the use of opioids for medical purposes as well as comments about the Government of Canada’s response efforts to the current opioid crisis. Using the NexaIntelligence platform has allowed Health Canada to find insights. 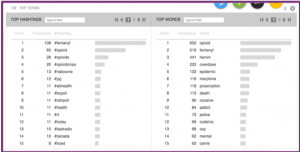 As an example, they discovered that medical use of opioids was commonly referenced, with negative sentiments slightly more common than positive ones. Morphine was mentioned in 39% of medical usage discussions. These findings could help guide future public health practices and could, at the same time, support community stakeholders in their efforts to understand and counter the crisis. To read the full article click here! Anti-vaccine propaganda is a growing issue for all social media platforms, stirring debate over their responsibility to monitor misinformation posts, especially on Facebook and Google. Some, like Pinterest, have chosen to outright block access to any content of the sort, but Twitter remains a target of anti-vaccine propaganda to this day, which is why we wanted to take a look at anti-vaccine rhetoric on the platform. We figured this was also the opportunity to test our Propaganda Filter, and find out if it would detect suspicious antivax accounts. First, we compiled a list of hashtags on anti-vaccine posts and refined it to this: #vaxwoke #vaxxwoke #vaxxedwoke #vaccinesharm #vaccineinjury #vaccinesafety #stopmandatoryvaccination #stopforcedvaccination #vaccinedamage #noforcedvaccination #antivaxxmom #cdcwhistleblower #Vaccinexchange #Vaccin8tionNews #Vaxxed #MMR. Using these search terms, we looked at data spanning December 31, 2018 to February 21, 2019, and found a sudden increase in the amount of tweets starting on February 10th, with significant spikes on February 17th and 19th. 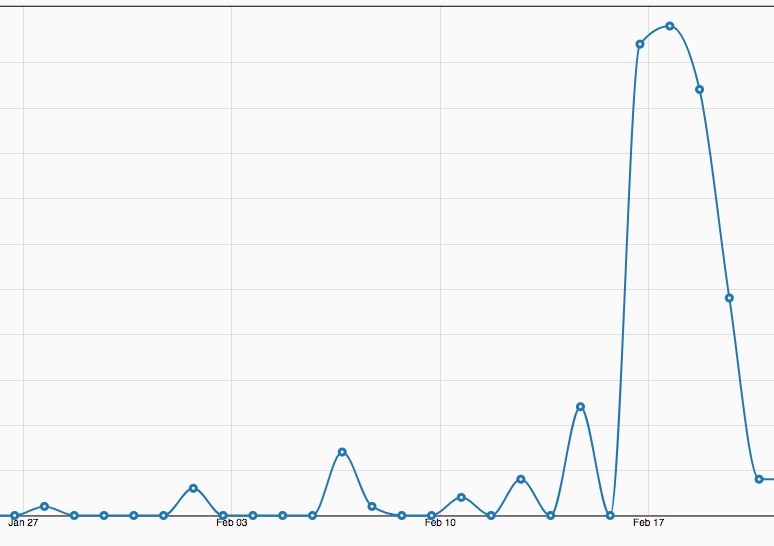 No particular event or breaking news explained the consecutive spikes of February 17th and 19th. For these dates, NexaIntelligence showed conspiracy-sounding posts, many of which directly mentioned @realDonaldTrump and @DarlaShine. Many of those tweets were in response to a tweet by Darla Shine, the wife of Bill Shine, current White House Deputy Chief of Staff for Communications. It appeared people were defending Mrs Shine against a CNN interview critical of her anti-vaccine rhetoric. 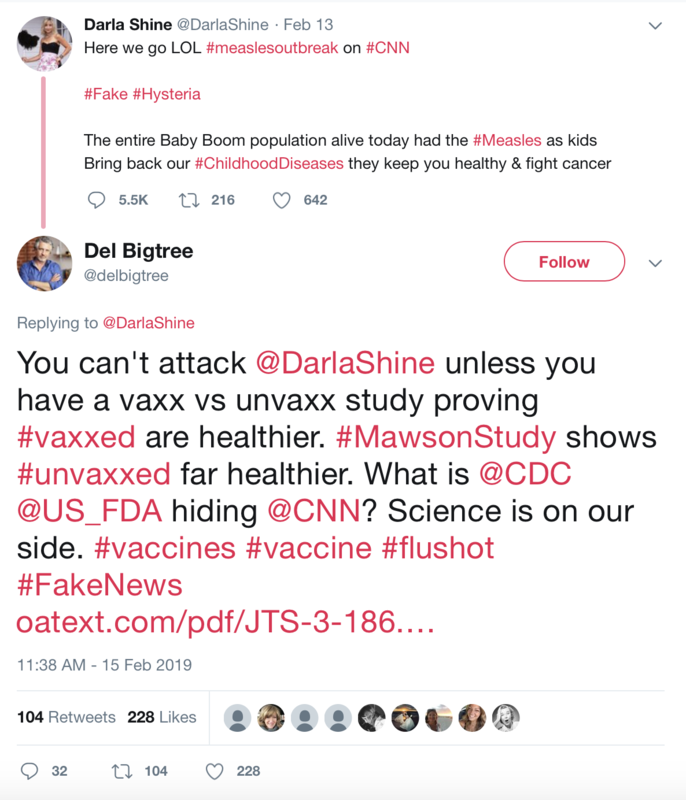 The tweet that sparked people’s interest in Darla Shine’s anti-vaccine stance this February was not her first on the subject, but it matters because of how much traction it gave the anti-vaccine topic for days to follow. Seeing that @DarlaShine was the second most mentioned user with 4,262 tweets (@realDonaldTrump being first with 7,050 posts) confirmed that her activity was at least partially driving the spike. 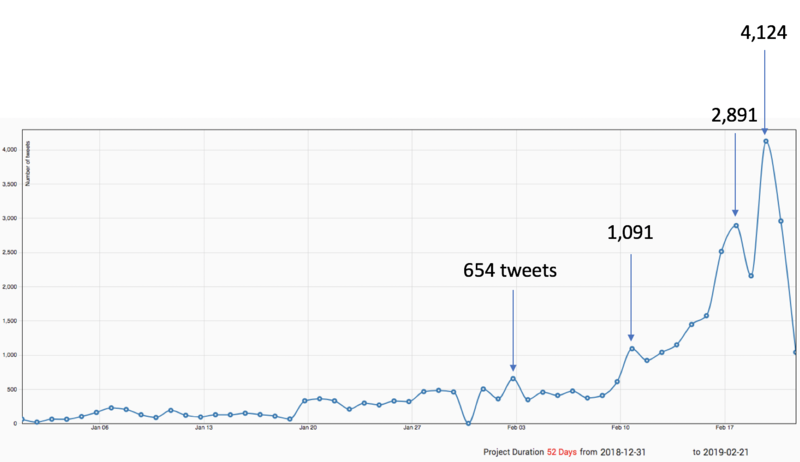 Twitter activity truly spiked on February 19th, both due to discussions surrounding Darla Shine and because of a tweet in which the National Vaccine Information Center @NVICLoeDown advertised their “no forced vaccination” campaign in Times Square. Two accounts seemed to post the most in this timelapse: @45HammerTime and @VirnaBurnayeva, their activity greatly contributing to the anti-vaccine buzz that day. The National Vaccine Information Center: pro or anti-vaccine? The National Vaccine Information Center has a very professional-looking website (nvic.org) about “informed consent”, its purpose being to inform the public on “vaccine science, policy, law”. However, the site states that its information “is referenced and has been researched, written and produced by NVIC staff or has been republished with permission of authors,” meaning it has no third-party verification, no government or institutional proofing, and we could not find a list of its sources or scientific basis to their arguments. In other words, the center appears to publish only whatever it believes to be true. Not scientific studies harnessing fact-based evidence and replicable experiments, nor competent experts’ testimonies, let alone scientific proofs that may contradict the NVIC’s stance. But the center does not shy from its ideology, it just doesn’t advertise it on its home page. The site eventually specifies NVIC was “founded in 1982 by parents whose children were injured or died following DPT vaccine reactions”, which is a clearer editorial position. 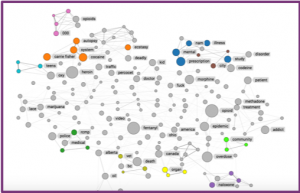 NVIC promptly shares the names of partners whose credibility is meant to reassure readers, so we looked at several of them to get an idea of their expertise on the subject. A recurring reference is Dr. Mercola, whose website advertises for various “natural” ways (read: supplements he sells) to prevent cancer and other diseases. Mercola gained prominence due to appearances on the Dr. Oz show, but many of his beliefs and advertisements contradict research from mainstream science. Mercola was notably ordered by the FDA to stop making false and illegal claims, on more than one occasion. A Chicagomag interview with him revealed: “Mercola is nothing if not a gifted marketer. His site bristles with provocative headlines (“Do Drug Companies Secretly Favor a World Flu Pandemic?”) and promises of astounding breakthroughs (“Zinc Can Cure Diarrhea”)”. The Guardian also covered his questionable medical claims. Even after spending hours reading these websites, it’s hard to know who and what to trust when it comes to medication and vaccines (see Health Canada’s study of the ongoing opioid crisis), which is why propagating anti-vaccine information is a powerful way to confuse the average reader. 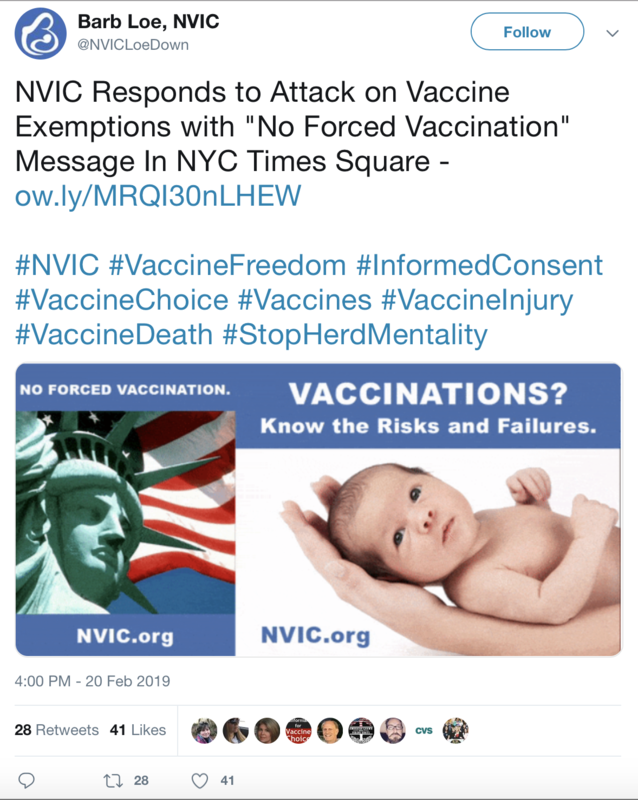 Focus For Health, NVIC’s other listed partner, seems to have a more nuanced approach to health and vaccine injuries than both Dr. Mercola and NVIC. They recognize the vaccine-autism causality link has not yet been scientifically proven: “Unfortunately, the existing research regarding the correlation between vaccines and autism is contradictory, leaving the question open to debate”. NVIC’s tweets are being retweeted by members of the group, who refer to themselves as “vactivists”. Most of these accounts seem to belong to American women who share each other’s posts, spreading anti-vaccine information to their close personal networks. Darla Shine only joined Twitter in October 2018, yet she has posted over 800 tweets in this time frame and gathered a following of over 4,000. Her following is similar to NVIC’s so we decided to look into each account’s follower list. It turns out a lot of Darla Shine’s and NVIC’s followers look and behave like fake accounts meant to create a buzz on the anti-vaccine topic. 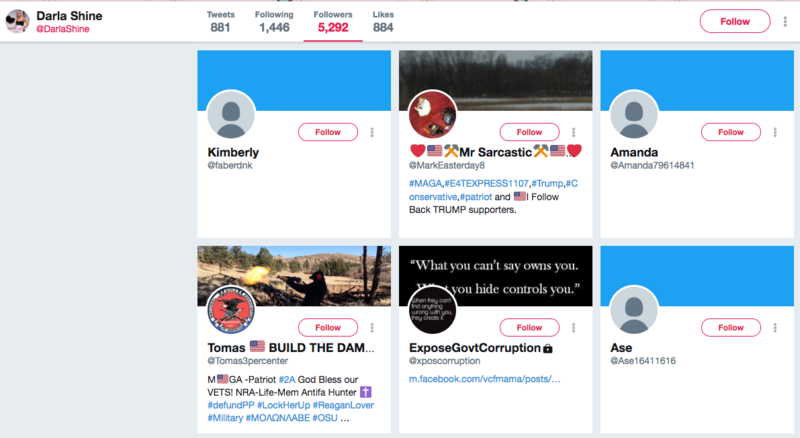 A pattern emerges when you look at those with an American woman’s name displaying only a profile picture (woman’s portrait) but no cover photo : these accounts were either created in February 2019 and have been blasting anti-vaccine propaganda since, or, they were inactive from the time of creation until February 2019, when they began blasting the same posts against vaccine and tagging Darla Shine and/or Donald Trump in each post. 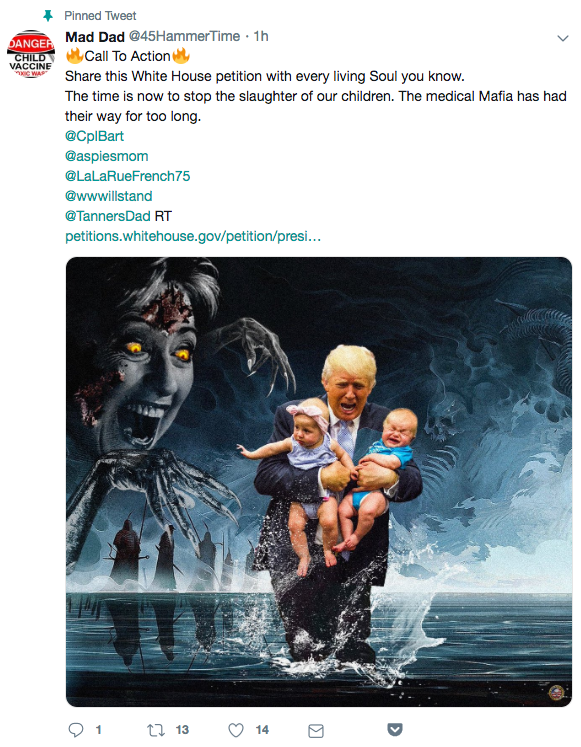 This account came up repeatedly for its aggressive anti-vaccine propaganda, which it tweets about over 10 times a day, tagging Donald Trump and sharing photo montages of the President saving children from evil forces. 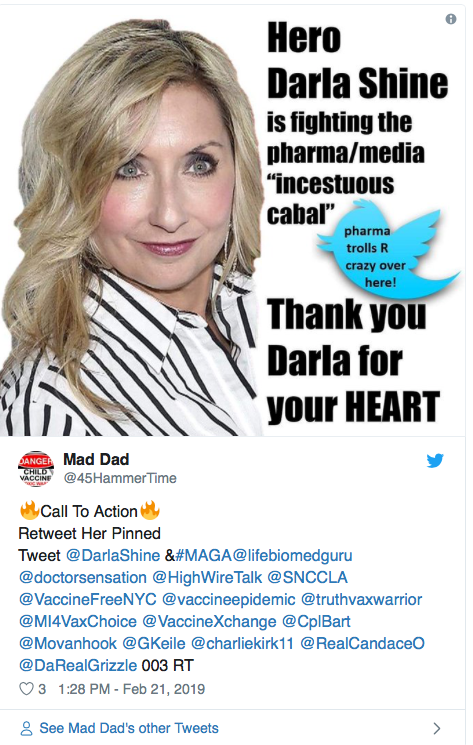 This account constantly posts about @DarlaShine and anti-vaccine rhetoric, and propagates the notion that Darla Shine is an anti-vaccine “hero” being attacked by mainstream media. 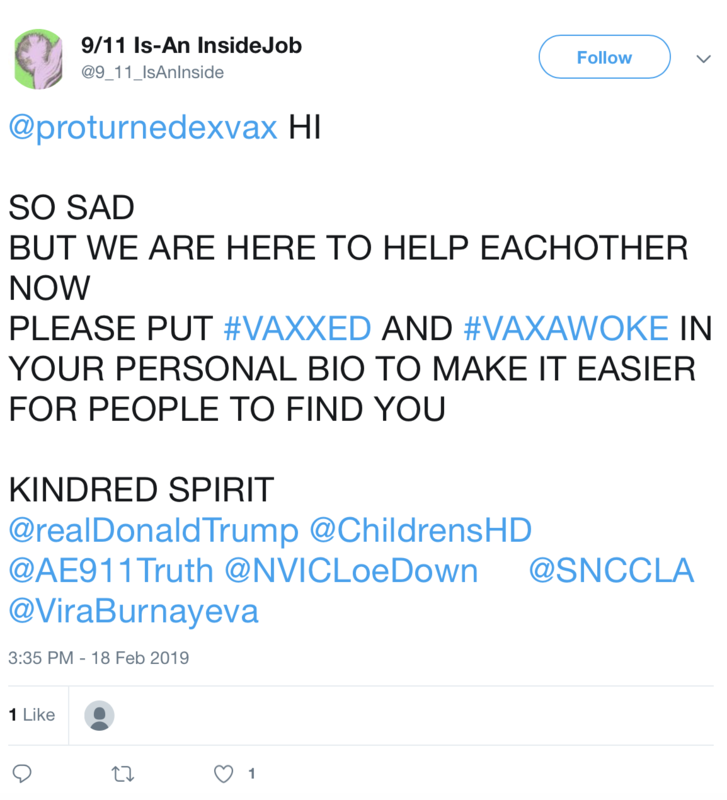 This account’s activity is suspicious as its sole purpose is to spread unverified information about vaccines and to build upon the notion that the current President would want to fight against pharmaceutical companies and vaccination laws. 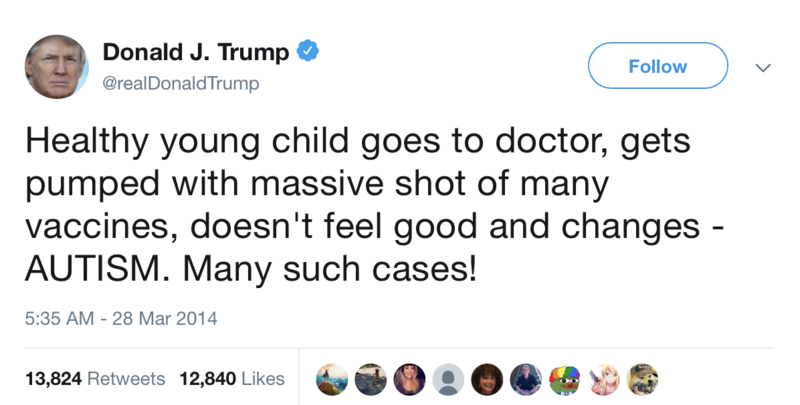 It is worth noting that Donald Trump has expressed support for the vaccine-causes-autism theory. 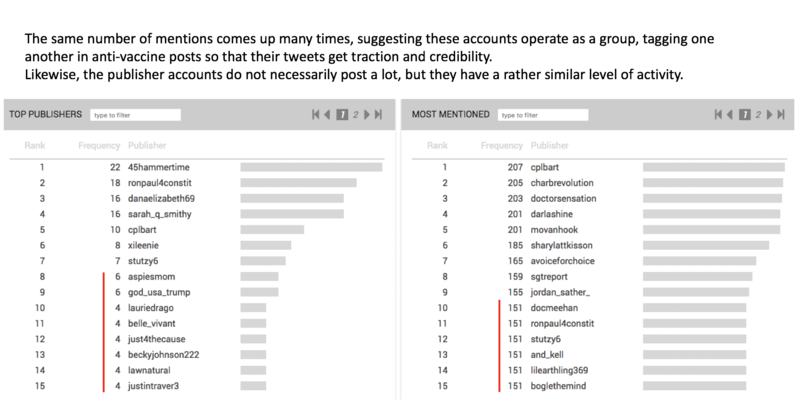 Next, we compared lists of top publishers and top mentioned accounts with and without the propaganda filter activated. 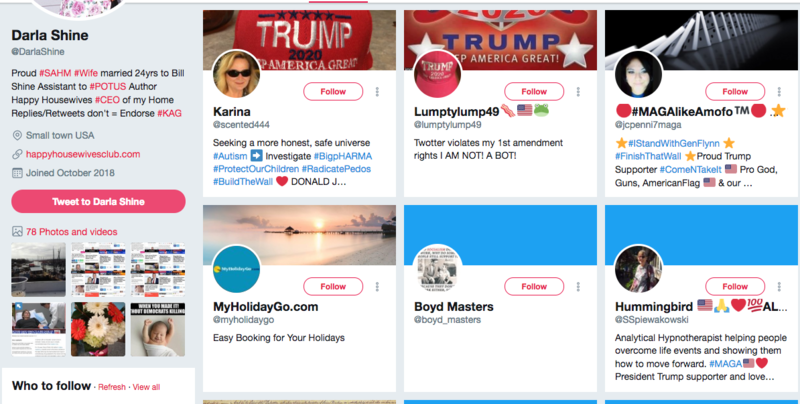 Minus a few verified accounts like Darla Shine and Donald Trump’s, you find the same Twitter handles on both lists, which tells us that a majority of the accounts involved in the buzz over anti-vaccines are in fact propaganda accounts. 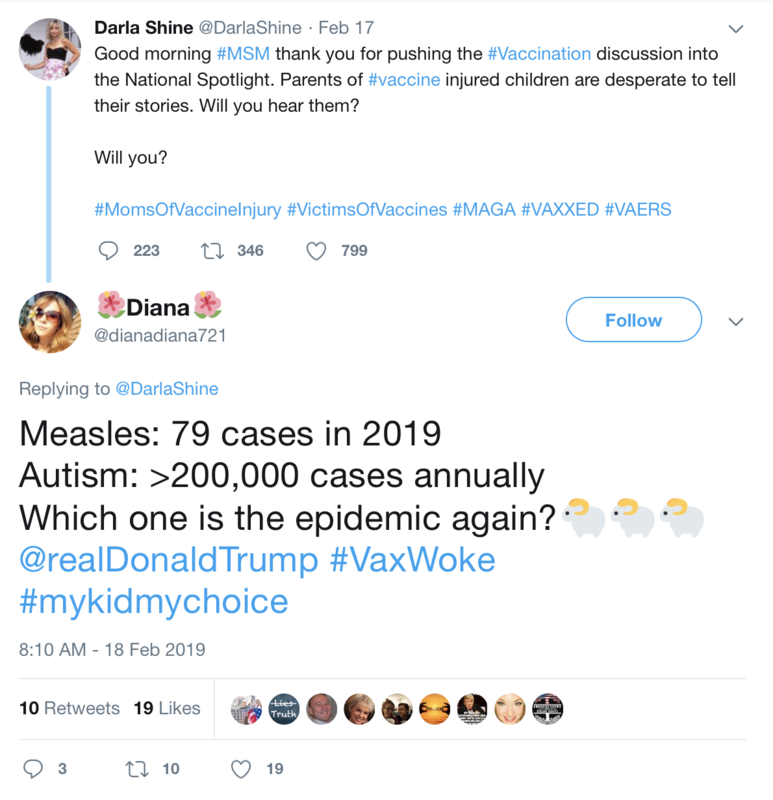 So there’s no obvious connection between NVIC and Darla Shine, besides the fact that their anti-vaccine tweets were picked up by a lot of accounts around the same time. 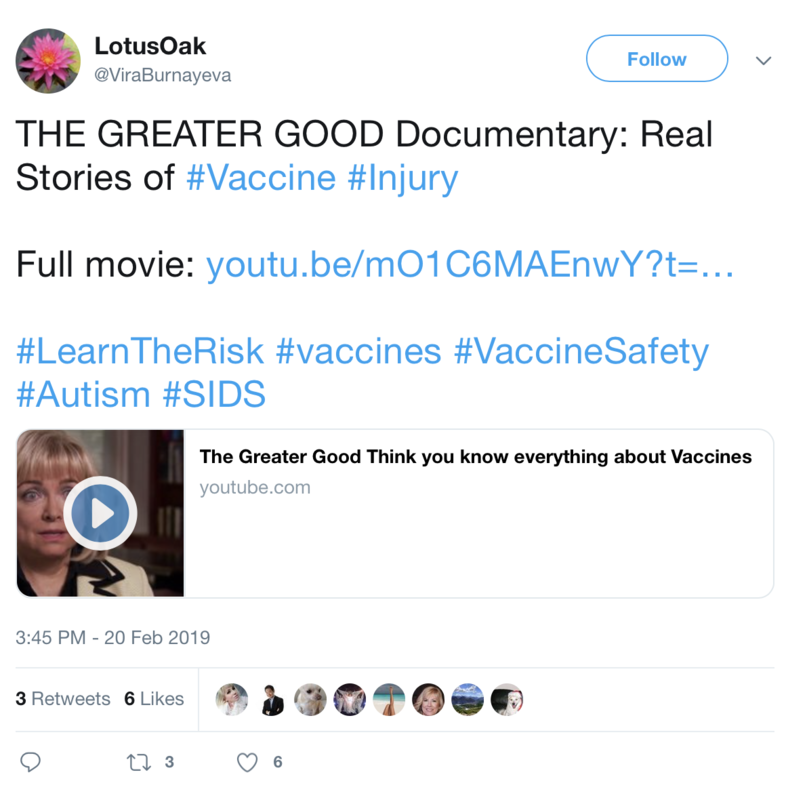 What does come up regularly are seemingly fake Twitter accounts retweeting the same lot of anti-vaccine propaganda, mentioning @realDonaldTrump or @DarlaShine in their anti-vaccine posts and making some mention of WWG1WGA or #MAGA. Using these last two acronyms also seems to point to the Q Anon group, which we’ll cover in a future blog post. 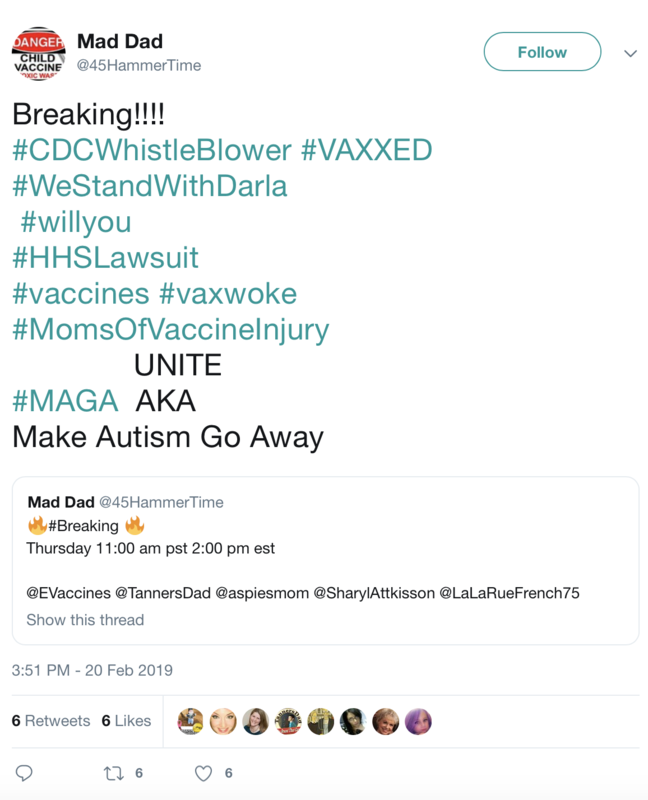 These accounts each have a relatively small following, but as a group using Darla Shine and Donald Trump as propellers for their propaganda, they have the power to spread anti-vaccine rhetoric to smaller networks of real people on Twitter. 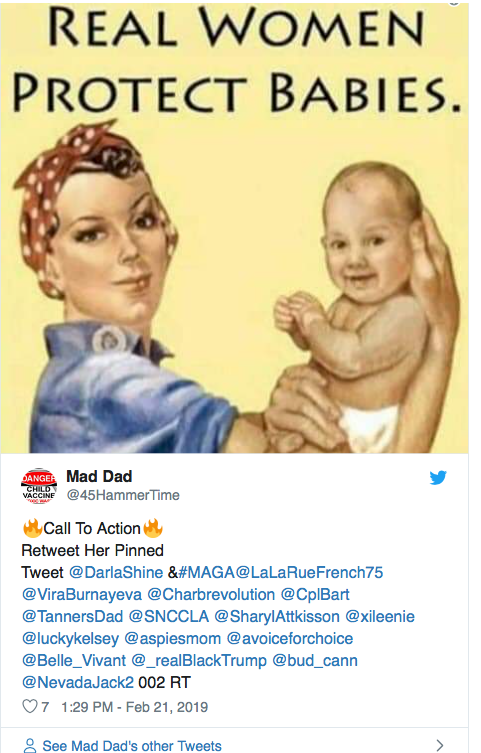 In passing, these propaganda accounts may look like the profiles of genuinely concerned American mothers, but a closer look will reveal they are part of a series of similar fake profiles. In conclusion, propaganda filtering is clearly needed to detect bot-net amplification of messaging like anti-vaccination tweets, especially when a public opinion debate about such a controversial issue ramps up in volume. This is why NexaIntelligence has its own ‘focus on propaganda’ filter, a key tool for social media discovery.